Inspiration for this blog post : My daddy dearest! To be precise, his outright refusal to accompany me and mom when we decided to shop clothes for me. TYPE 1 : The Real Random Picker. She wakes up in the morning and pulls out what ever comes to her hand first. Though she ensures the ensemble is coordinated enough ,most of the time she is real gorggy when she picks her clothes for the day. Her shopping habits : She is most likely to be an impulsive and an obsessive shopper. she virtually picks which ever clothes she likes when she sees. She has a very dim idea of what her wardrobe actually contains. When she realizes her wardrobe is overflowing, she would clean up,discard and make the same mess all over again. TYPE 2 : The Organized Random picker. Her Shopping habits : She doesn't plan her shopping exactly. Its more of on the minute desire to go shop. Yet she knows what she has and picks clothes which appeals to her at that point of time. But she ensures her wardrobe is unique enough with no repeats. TYPE 3 : The partly organized picker. She decides what clothes to wear at least a day before hand. Yet there is no guarantee that she might change her decision and pick something else. Her moods reflect on her "what to wear" decisions. TYPE 4 : The Perfectly Organized picker. She decides what to wear a least 2 days beforehand. She has a schedule of "What to wear" based on her daily agenda, she has contingency clothes set apart. She has her clothes sorted based on occasions and how old they are.She re-arranges her schedule every month. She knows what she needs. Her Shopping habit: She is a meticulous shopper. She shops to the need ( The more of "Just in time Inventory" kind of shopper). She is virtually devoid of any urges to buy that one piece of top/skirt/tee which is so tempting. So now we have covered the basics on women shopping "Pattern" ( The topic of "What to Buy" is worth more than one separate blog post! I am not getting into that right now). But how many women are there in each category? Type 4 is a real rarity. Type 4 kind of women are the business type who are mostly executives and stack their wardrobes with suits and whole "formal" range. Type 3 is rare, but isn't unheard of. I'd say about give or take 5% women belong to this category. But a note of fair warning here, We ladies tend to shift categories over a period of time. Now coming to why dad refused outright. In chennai, there are many shopping spots where we get clothes right from dead cheap to insanely expensive. I prefer to shop at TNagar, Pondy Bazaar and Pantheon road. TNagar! I don't think there is need to elaborate about this place to Chennaites. But for the rest of folks, TNagar is a overcrowded shopping hub where you can pick anything ranging from electronics to clothes to groceries to accessories to what-not for a reasonable price. I normally go shop with a particular color or pattern in mind but I am not too rigid about it. I tend to visit at least 3 shops before I pick one dress. But hey come on! Choosing from so many colors, patterns, materials isn't easy. We women have almost infinite options. What do men have? Trousers (Max Shades of Black,Blue,Brown ,Cream,White), Shorts,Cargos, Shirts (Just the usual Stripes/plain/checks), T-shirts, Kurtas, Coats, Jackets? That's almost the entire list. Women have all the above said PLUS a whole range of skirts, tops, blouses, Various types of salwars in What-Not Colors and a long list of other stuff. And we have to shop for matching accessories , Bags! Phew! So its a whole colorful world with lots of options to pick from. Not an easy task. All said, at the end of the day we girls want to look good in what ever we wear and we take effforts for that. Not a crime! Now you decide! Is shopping for us an easy thing to do?! PS: Dear Daddy! Be a sport! My first entry in 2013. And I chose to begin it with Gold. GOLD! The Precious yellow metal most sought after by women ( Ironically, After the recent 5-year old girl abuse incident in Delhi, I keep wondering if there will be any women alive in this country in future to wear this yellow metal). Like all Indian Moms having daughters, My mom also decided to go "Gold shopping" after Gold prices began to landslide recently. As anticipated there was a huge crowd when we hit the jewellery shop. We were in the shop for about 3 hours and there was no sign of the crowd receding, in fact it was quite opposite. This mad rush for that yellow metal which is burning a hole in purses got me thinking. Why is gold so important for us Indians? Chemically Gold or Aurum (Latin/Chemical name) as we kids knew it in chemistry class, is a soft, malleable (Meaning it can be stretched into thin wires, literally Hair-Thin)and inert metal. It is not affected by exposure to air or to most reagents.Hence it is not tarnished like silver or does not loose its sheen and can be worn over ages. The purity of gold is measured in units called as Carats. 24 Carats is the maximum level of purity. Normally ornamental Jewellery is 22 Carats, i.e. 22 parts of gold, 2 parts of other metals like copper/rhodium/silver/zinc/cadmium. 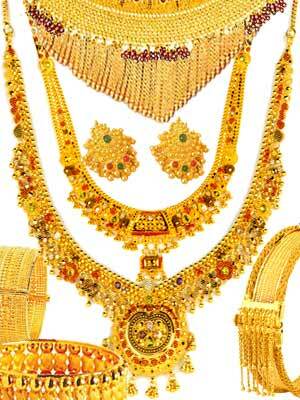 In chemical terms, ornamental jewellery is not pure gold, rather it is an alloy of metals. Hence after prolonged use, Ornamental gold changes color from dull yellow to slightly reddish yellow. Gold is the symbol of Hindu goddess Lakshmi.The Hindu God Brahma is referred to as Hiranyagarbha which means born of gold as he is born from the cosmic egg of gold. In Hindu mythology, some of the gods and goddesses are described as golden hued with reference to their beauty. Given that majority of Indians are Hindu, Gold thus symbolizes prosperity and hence the tradition of giving a women gold when she is married off. Yes, I agree. Gold is the best asset that can be liquidated easily for instant cash when in dire need. But trust me these days people are truly insane. Kilos of gold?Honestly! Its give me migraine just to think how to safeguard all that gold. Also there has been many historical references to gold being used as currency without denomination till the 6th BC Century and with denomination since the 7th century BC till about the Mughal Invasion in India, where in Sliver took over as replacement. There are historic evidences that show that gold coins may have introduced somewhere between 2500 and 1750 BC. We now know the history and chemistry of gold. Then why is this metal so expensive even in the form of bars and coins, leave alone Ornaments? Gold is a relatively rare element, making up only 0.000 000 4% of the Earth’s crust (by mass). You would need at least 250 twenty-tonne trucks full of the earth in order to recover just 20g of gold; that’s a cube of gold with approximately 1cm sides. Gold is valuable simply because it’s scarce and difficult to extract.However, gold is by no means the scarcest or even the most expensive metal. Yet, the process of extraction, purification and separation ( And a whole list of another -tions as my chemistry books once suggested) just adds up to the insane cost. Plus excavation for over a period of time has depleted the sources. Now to the Billion Dollar question. To Buy or not to Buy? So now you know why gold is a good investment. The thing with ornamental gold is that, jewelers charge anywhere about 6% to 20% on wastage and 3% to 11% on making charges. The more intricate pattern the more are the wastage and making charges. But why do they add this "Wastage" along with the justified making charges (after all it takes some skill to craft beautiful jewels!) ? When a bar of gold is alloyed and cut into intricate patterns fine dust of gold falls off. This dust cannot be reused most of the time. Though the quantity of dust generated may be of considerate amount and also for a fact that gold dust is consumed in some parts of the country as medicine, Still, Waste is waste and "gold waste" still carries the cost of gold. Hence the Wastage Charges. if you want to buy something like this be ready to empty your bank accounts! Stone jewellery are a different story all together. Jewelers charge for the amount of gold displaced to place the stone over the gold base and they also charge for the stone that is placed. Thought the sheer beauty of a stone necklace is unmatched. Yet. These days there are better imitation jewellery with a variety of designs and price range. And frankly I simply wonder how people can buy 100 sovereigns of gold ornaments and wear the same old jewels all along life. Hence buying few pieces worth about 25 sovereigns is more than enough to "flaunt". I am in love with this concept! Reason : They aren't actual physical gold. They are stocks which are traded in line with prices of gold. Hence there is no worry of Gold quality degradation and the very obvious threat of gold being stolen. With the number of gold theft cases increasing, I personally feel gold stocks are best bet to have a peaceful sleep even if you technically own 100 sovereigns of gold! VERDICT : I am no Economist. I am no Genius. But I am a girl. I do have a liking for beautiful gold Jewels ( Thought not this crazy kind of liking). I would probably buy some nicely crafted pieces for upto 15 sovereigns and then keep buying imitation pieces as when the trend changes. I would also invest in about 10 sovereigns of gold coins/bars just in case a need for quick cash arises. My best bet would be on Gold stocks where i'd put my money on. But I'd tread real careful with the gold stocks, for stocks are double-edged swords. DISCLAIMER : This was written purely on an impulse after spending4 hours to pick a gold ring weighing just 4 Grams and bill in the highly crowded Jewelry shop ( Yeah, GRT!) In my state of mind you would probably give up buying gold jewels.